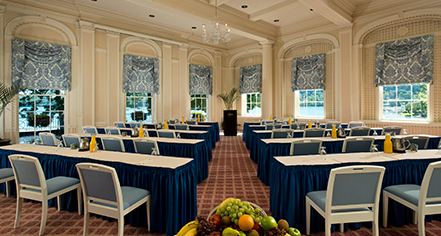 The Otesaga Hotel has 12 different meeting and conference rooms of various sizes ranging from the 2,625-square-foot Ballroom and the Main Dining Room to small breakout rooms like the 384-square-foot Pathfinder Room. With 12,500 total square feet of meeting space, the hotel can arrange for corporate gatherings, conferences, special events, weddings, and parties. The Hotel’s Meeting Planners will customize arrangements for any group, including entertainment such as golf outings on the Hotel’s world-famous par 72 Leatherstocking Golf Course, private tours of The National Baseball Hall of Fame and Museum, and receptions in several outdoor areas of the beautiful resort grounds. The Hotel opens its doors each year in mid-April and closes for the winter after Thanksgiving. Meeting packages typically include accommodations, meeting spaces, all meals, and access to The Otesaga’s sports and recreation facilities. Group rates require a minimum of 10 sleeping rooms. Meeting packages are not offered in July or August. Between December and mid-April, groups of 60 rooms or more can also experience the relaxing winter beauty of Cooperstown and The Otesaga at special winter package rates. 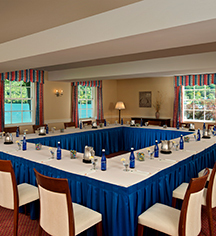 Guests can utilize the 12,500-square feet of meeting space and 12 function rooms at the nearby Otesaga Hotel year round, which can accommodate groups as noted above. Amp up your next meeting at The Otesaga, where gracious hospitality, 30,000 square feet of flexible event space, and AAA Four Diamond accommodations make productive meetings fun. With an iconic setting surrounded by breathtaking views, you and your attendees will experience how it feels to be treated like family – all at an amazing rate. Booking Time Frame: March through December 2017, midweek only. *Offer available midweek (Sunday – Thursday) for new bookings in 2017. Must mention offer when booking. Not to be combined with any other offer or discount. Discount not applicable towards food and beverage. Must book a minimum of 20 rooms to guarantee discount. Restrictions and blackout dates may apply.